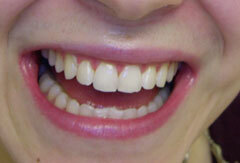 Tooth whitening whitens the teeth, removes stains and creates a bright smile. Dye in food and beverages, smoking, some medications, genetics and trauma to the teeth can cause tooth discoloration (darkening). 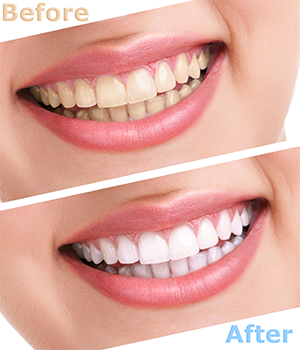 Tooth whitening could be a great cosmetic solution for removing these stains and making your teeth much whiter and beautiful. Home Tooth Whitening: An impression (mold) is taken of your upper and lower arches (teeth). It is poured-up. From the casts (models), precise trays are fabricated. 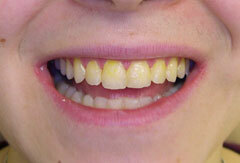 You will apply the tooth whitening gel inside the trays, and wear the trays according to the instructions. Usually a treatment of 1/2 hour a day for 2 weeks will be adequate. Sometimes longer treatments are indicated. In-office Tooth Whitening: It involves specially designed whitening agents in combination with plasma lights to produce dazzling results. The whitening agent is a scientifically formulated and balanced peroxide solution. It is activated by the sapphire light, penetrating the whitening agent into the tooth structure. The time required to whiten teeth is approximately one hour. Yes, the in-office procedure is completely safe and has been well-tested by thousands of dentists. What will I experience during a tooth whitening procedure? During the procedure you may comfortably listen to music or just relax. Your lips and gums will be first protected and then the whitening light will be placed to activate the whitening gel. You will be monitored throughout the procedure to ensure your comfort and protection. There is a chance of feeling some degree of sensitivity on your teeth and gums. How much whiter my smile will become? The change to your smile can be quite dramatic. You can expect your teeth to be up to 10 shades brighter in an one hour treatment. Make an appointment today with Dr. Mazza in Bethesda, Maryland for your whitest smile yet!